We went back to Dan’s place and ate some frozen pizza. By this time it was 4am and nearing the 2 hour mark of my departure. Adam and Allison drove me to the airport (which was very close) and we said our farewells and I returned to Adam the nice shoes he loaned me. I waited in the airport like a zombie until I could check in for my flight. Luckily my seat was situated on a perpidicular row of the airplane so I had plenty of leg room. I fell asleep before take-off and woke up as we were landing. From the airport I took a taxi to Platapus Hostel and slept a few hours in my room. The rest of the day I meandered around the neighborhood, getting my bearings on the area. Today I took a cable car to the top of Cerro de Montserrat. 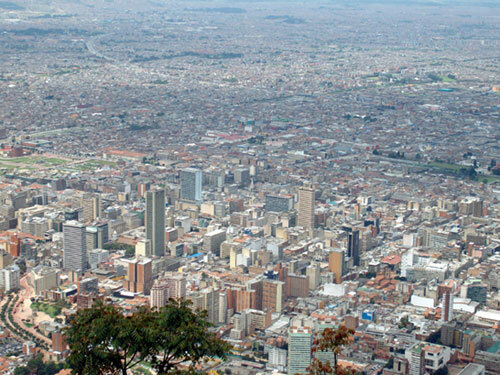 It’s a steep peak that towers over the metropolis of Bogotá. I’m realizing that I have a penchant for lookout points now. They let you see a city from a whole new perspective. Afterwards, I went to a couple of musuems, some of which were closed because it was a Monday. The Botero musuem was amusing (and free). His fat subjucts always make me chuckle. The women remind me of Robert Crumb’s drawings. There were also couple of Picassos too. I sense the clock is ticking and I have to be in Ecuador in 14 days. It wouldn’t be bad to get there a little earlier too. So, tomorrow, I’m getting on a bus to Cali. Spend a day or two then get into Ecuador.